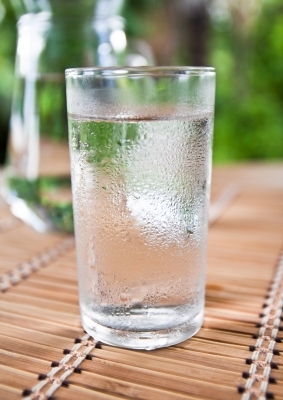 You hear it all the time–drink at least 8 glasses of water a day. What does water do for you–and lack of water do–when you are eating low carb to lose or maintain your weight? Three things. 1) It’s the job of your liver to metabolize fat. If your kidneys don’t have enough water to do their job, however, they send some of their work over to the liver. Then the liver has less bandwidth to metabolize fat. 2) On a low carb eating plan, you literally urinate out portions of fat molecules called ketones. You are not only “burning” fat–you are also excreting fat in your urine. See page 170 of No More Fat Kids. Without enough water, this process slows down. 3) If you don’t drink enough water, your body tries to conserve water, meaning you will weigh more. If the body has plenty of water coming in, it won’t retain water. So, paradoxically, drink more water to get rid of water bloat. Drinking A LOT of water has been critical to Juliana’s progress. When she came home from six weeks of traveling, in August, 2012, we found that Juliana had maintained her weight while growing half an inch. She resumed a very low carb eating plan to give herself another weight loss jump start after a summer of less control over her food. But after five days, she had gained a pound. On the one hand, a pound could be normal variation. On the other hand, the more experience I get the more I feel that she is likely very sensitive to carbohydrate, and it is not easy for her to lose weight even on a low carb eating plan. Unlike an adult who finds after the age of 40 that they can’t maintain their weight on a high carb diet after a lifetime of high carb eating–she was sensitive to carbohydrate already at a young age–she became obese over one year from 3.5 to 4.5. And she isn’t one of the many people you read about, if you poke around in the low carb community, who dropped 5 dress sizes in as many months eating low carb. So to me, a gain of a pound when we were trying to jump start her weight loss, when she hadn’t been doing a lot of strength training or the like that might argue she had added muscle, was significant. We reviewed many tips and tricks. I zeroed in on water. Juliana has never felt much thirst, or drunk much water. I’ve encouraged her to drink more water for years. We set a goal of a gallon per day. She has a 32 ounce water bottle she fills and empties four times. As her coach, I check in with her during the day to see how many water bottles she has finished. I frequently find the water bottle in the house, fill it with ice water, and bring it over to her. After 3 days of drinking a gallon of water per day, she had dropped a pound and a half, and is now at her lowest weight ever since we started the low carb eating plan.